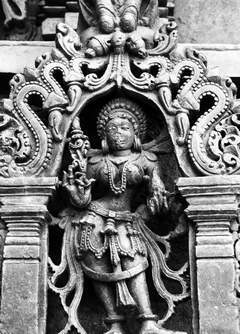 The Chennakeshava temple at Belur is perhaps the best specimen of Hoysala architecture and sculpture. The place was known as Velapura or Velapuri. 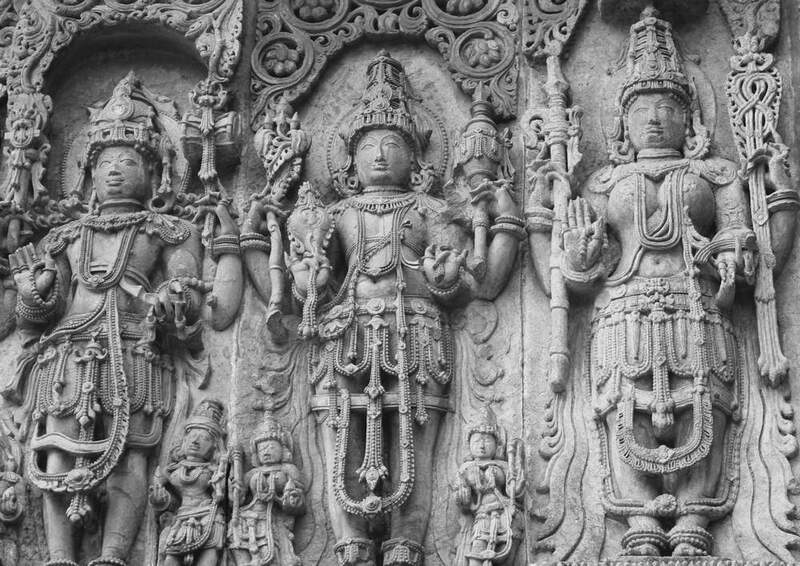 Hoysala King Vishnuvardhana defeated the Cholas at Talakad and to commemorate this great event built many temples in 1117 CE, of which Chennakeshava temple at Belur is the most important and beautiful. The entire temple is built of soapstone and stands on a platform also of star shape of 32 angles. The outer wall of the temple from bottom onwards has tiers of minute sculptures consisting of rows of elephants, lion faces, creepers, ornamental frieze, dancers in small niches, female sculptures in between pillars, and the stories of Ramayana and Mahabharata. Above the friezes are wall sculptures of gods and goddesses in various poses under finely carved canopies. These sculptures are so varied and finely ornamented, it looks like an open air museum. The ornamented windows called jalandhras which were added at a later date allow sufficient light and air to enter the interior of the temple. Over the sculptures and on the level of the roof are bracket figures known as silabalikas or madanikai sculptures. 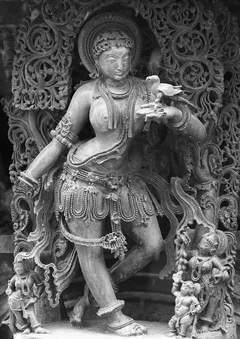 They represent beautiful damsels in various moods representing feminine charm and grace and perhaps these are the best creations of the Hoysala sculptors of the Belur temple. 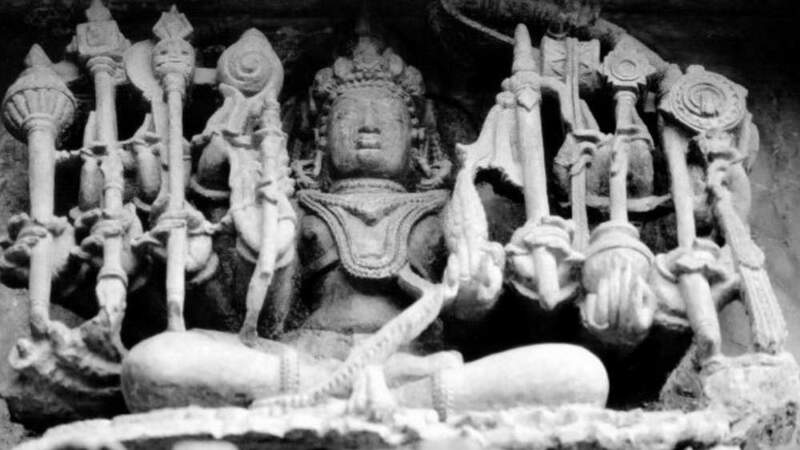 Vishnuvardhana’s queen Shantaladevi is associated with these sculptures. The interior of the temple consisting of a garbhagriha, sukhanasi, navaranga and a mandapa takes us to a new world of sculptures with lathe turned pillars of various designs. One of the pillars known as Narasimha pillar could be turned on its axis. There are many delicately carved ceilings and they represent the best specimens of that type. The doorway of the garbhagriha is another specimen of delicate carvings unsurpassed for intricate designs. Inside the garbhagriha is the sculpture of Chennakeshava or Vijayanarayana of about nine feet in height holding sankha, chakra, gada and padma in his hands, with a karanda makuta (crown) at the head. Bhudevi and Sridevi are standing at the bottom. Famous sculptors like Dasoja, his son Chavana, Nagoja, and others made this beautiful temple, the pride of Karnataka. Besides this temple, the prakara has many more temples like Kappe Chennigaraya temple, Devi temple, and others with a mahadvara and a gopura.